What's worse than having a song on your brain? 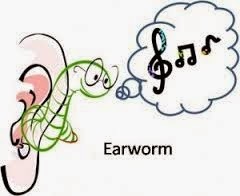 Having a song on your brain that you don't know! My niece Rosie is going to Paraguay. She is the oldest of the nieces and nephews and it is amazing that she is old enough to do such a thing, but she is. And she is having a going away party today, a party I am not at because I woke up to a flat tire on my car and things just went from there. That is another story for another day. For now, my point is that I had been planning for weeks on going to this party. And every time I so much as thought about it, I got this silly song on my brain called "Going Away Party." It goes: "Going away ... going away party. Going away ... going away party..."
And that is all I know of it. You can read this without worrying you will catch it. Nobody knows this song. It was done by some Buffalo band a thousand years ago. One of the bands I used to go here, maybe the Steam Donkeys, maybe John and Mary, maybe Gretchen Schulz, who knows. And this was an original of theirs. As band originals go it was not the worst but it is not as if it is some song by Mahler or someone you would not mind having on your brain. "Going away... going away party... going away .... going away party..."
I should never have written about this. Now there it is on my brain again. Easily leapfrogging over all the beautiful piano pieces as performed by Leonard Pennario that are also stored away in there. It is like bishop's weed. Except that you cannot eat it. There is no redeeming value. Imagine if I were actually at the party! Imagine how bad it would be then!